This week’s Friday Field Foto is from the French Alps and shows a very cool stratigraphic relationship that is commonly observed in regional-scale seismic-reflection data but not as commonly recognized in outcrops. Note the two sandstone bodies in the photo above — they are the resistant cliff-forming rocks that are wedge-shaped and pinch out from left to right. The upper one appears to pinch out to the left but I am told by those who have climbed around on there that that is a function of it getting covered. The other thing to note is the fine-grained strata in the lower part has a slightly blueish to gray-blue color. This next photo (above) is the same photo with some quick (and sloppy) annotation pointing out where those sandstone bodies pinch out. The interpretation here is that the older blue marl strata was uplifted and tilted and the subsequent turbidite deposits (both the sandstone bodies and the brownish fine-grained strata they are encased in) filled in that basin — and what you are seeing here is the margin of that basin. Yoiks! That’s an amazingly sharp contact! So is the interpretation that we’re looking at a cross-section that’s normal to the direction of the turbidity currents (i.e. the flow would be coming out of or going into the plane of the photo)? 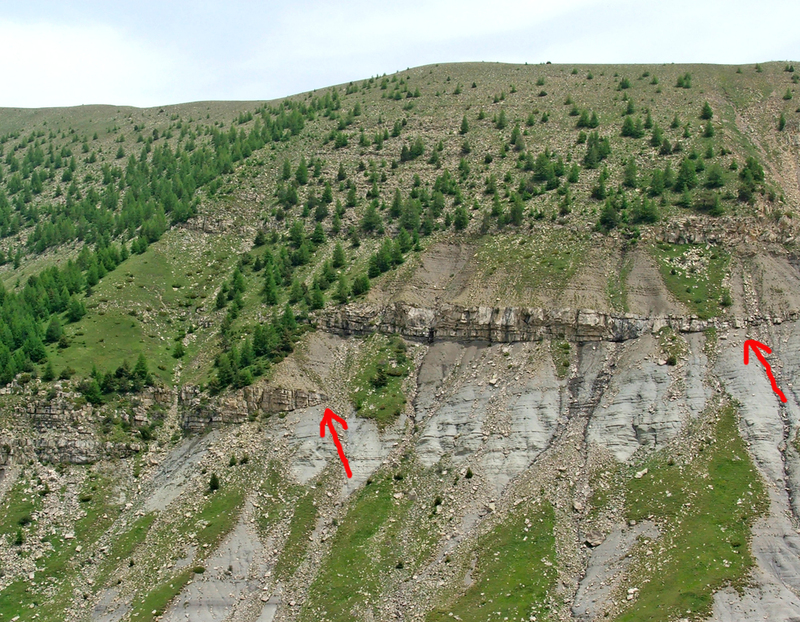 Is there evidence of scouring of the blue-grey marl subcrop surface (rip-ups entrained in the basal turbidite sands, etc.)? Cool photo! Howard … yes, this is essentially a cross-sectional, or depositional-strike, view (paleoflow might be slightly oblique but I don’t remember exactly). I think there is some erosion/scour of the underlying blue-marl, but it is relatively minor and localized within the context of the entire basin. I also remember reading that the blue-marl was compacted much more in the axis of the basin suggesting some sediment-loading-induced subsidence, which may have led to increased accommodation and, in turn, more deposition. A lot of petroleum geologists visit these outcrops to investigate the sandbody architectures and pinchout geometries to try and relate to the salt-influenced basins in the Gulf of Mexico. Very cool outcrops! Our French’s best of, probably :) Nice outcrops, nice mountains, and small villages with typical markets and great food everywhere… ! As well as minibasins dynamics, it is a good place to see the typical facies associations (Bouma, Mutti) and hyperpycnites as well. The upper bed shows some ‘expected’ thickening from right to left (basin-ward). Nice discussion. Check out today’s Earth Observatory image of the day, showing sedimentation in Gulf of Mexico. Mike … wow, that is a fantastic image! Thanks for the link.